U.S. immigration law is often perplexing to those who desire to enter or stay in the United States for business or other reasons. Such confusion is not surprising as the rules are extremely complex and subject to frequent revision in agency interpretation. 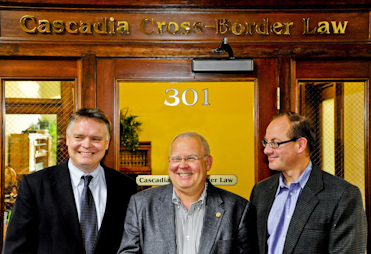 The experienced attorneys at Cascadia Cross-Border Law will guide you through myriad complexities to determine the best solution for your particular situation. We can provide knowledgeable representation with a long history of success with our Canadian clients from Vancouver to Toronto, as well as other clients from around the world. A consultation with one of our experts will save considerable time, expense, and inconvenience in solving the immigration puzzle. Our clients include a broad range of established businesses and persons of talent. Our immigration experts regularly meet with clients at our offices in Bellingham, Washington and Vancouver, British Columbia. Our website provides an introduction to U.S. immigration law and procedure as it relates to brief business trips to the U.S., establishment of a U.S. branch for a foreign business, investment in or international trade with the U.S., employment by a U.S. company, and a variety of other business immigration matters. In this regard, a number of categories of temporary (non-immigrant) business visas exist. Additionally, there are several categories of permanent resident (immigrant) visas based on offers of U.S. employment or investment in a new U.S. business. Permanent resident visas may also be available in cases where a qualifying family relationship with a U.S. citizen or permanent resident exists. Please Contact Us to set up a consultation with one of our immigration experts who will help you select the appropriate visa for your particular circumstance. -Jim Pettinger, UCanTrade, Inc. Ferndale, Washington and Vancouver, B.C. Please note that every immigration case is different. Results may vary from case to case depending on facts involved.